OMG I know where this was taken! The number of suspicious individuals in the shops increased. Giant Dicks! Only at Wal-Mart and Sam's Club! "Now for our next stop in Harlem"
Your wife just sent you to Wal-Mart.... Now what did she send you for? “Grocery Chain & Sporting Goods retailer partner in move to boost market share”. Great. I move to this new town and think I am finally going to be able to live a quiet life, just like everybody else... and then some a**hole discovers my family secret and starts advertising it around town. Thanks whoever you are, thanks a lot, signed, Tripod! The Golden Strip. 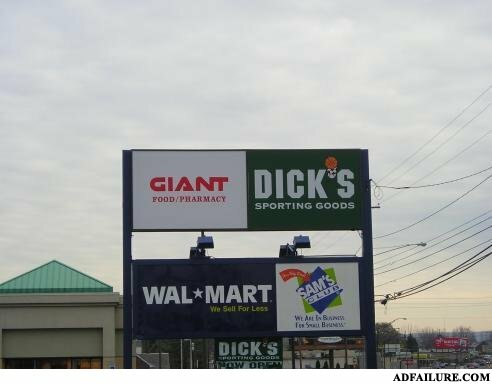 Best known for its shops and Giant Dicks. There was a small boy with a lollipop and a spinning hat. He died of lieukemia.